It’s been quite a while since my last post as the administrator of this site. Time always gets in the way especially in maintaining multiple blogs. But now that Leif is almost done with the maps of Davao which he’s been keeping busy with, I guess it’s time to update you with the latest development of his creation. He is actually drawing two maps of Davao – one is a Map of Davao which covers solely Davao City centre and nearby vicinities. 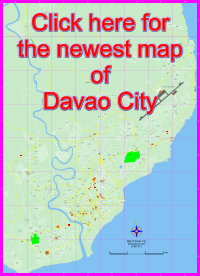 The other one is a Map of Greater Davao Area which comprises Davao City with surrounding areas from Tagum City in the north, to Digos City in the south and it also includes the Island Garden City of Samal. Please tell us what you like or dislike about our maps. We would also like some help with naming subdivisions, streets and other places. Very nice maps. The most detailed I’ve been able to find. Thanks! Thank you for your comment. We appreciate it very much. We’d love to hear how people think of our maps so we could improve them. Both maps are still being updated every now and then. Hello Marlene – Great job on the maps, best I have see also! If you are taking village name additions, I can place a few of them for you, including Spring Village, Ma-a in my own Purok 15 and also Mamay Village, Angliongto Rd (formerly Mamay or Damosa Road) in Lanang. You could become the Wiki Maps of Davao. Stacey, that’s great! Thank you so much for your interest in helping us with the maps. We will contact you by email how we go about it. But would soooooo love to visit Davao one day. Rozie, welcome to Davaozone, hehee! This is my blog that’s lost in blogsphere. No regular maintainance. We’ll maybe meet in Davao someday. Keepin’ my fingers crossed. Hi Marlene! 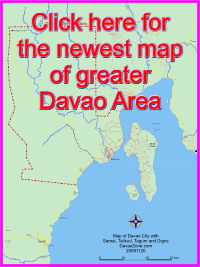 I found your site while searching for Davao map. My husband Frank, who is a norwegian, noticed that Leif made the map and he is curious if Leif is also from Norway. PS. We liked the map. We’re glad that you found our humble site. Oh, we’re just neighbors, hehee. Leif is a Swede and we’re living here in Sweden. Hi I’m a student. I am currently working on a thesis related to map making. May I ask for your expertise on this? Your map is actually good.